The Inexplicable | A Daily Dose of Zen Sarcasm! If you are interested in this "pair", they are still waiting to be adopted on South Carolina Avenue. Sometimes, things cannot be explained. No matter how hard you try to figure something out, the pieces don’t add up to what’s expected. This can be a cause for vindication, as in the local case of a Bethesda, MD, Lululemon employee who appeared to have been attacked along with a fellow employee and killed within the store: what happened instead was that the employee who was not killed appears to have been the perpetrator of the crime, faking her own attack to get away with, um, murder (sorry). Being face to face with the irrational is unsettling: it makes you wonder if it is you who is crazy or irrational. It makes you judge and doubt yourself to the core of your being, and it makes you nauseated and disoriented. But it’s also like a reset button: an encounter with the irrational makes you rethink your priorities; adjust your mindset; and sometimes discard those pieces of evidence or fact that are either incorrect, outdated, or no longer serve or help you. 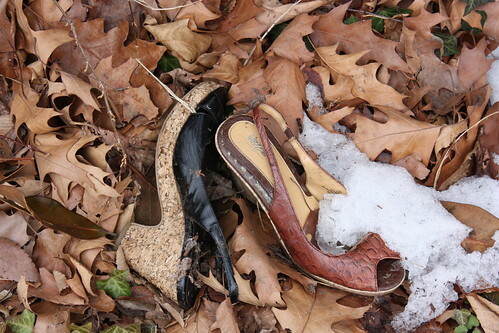 Like the shoes in the picture, sometimes the irrational is just that: a couple or so of things that once were useful but no longer belong together, or with you, and which now can be shed and forgotten about. UPDATE: I love this story on TBD.com about the Lululemon murder. No, none of us saw it coming, although we all wish we could have, somehow. But when one person seems to have insight into the pieces that don’t quite fit, people are quick to dismiss it. That is the net effect of the irrational: it makes everyone think you’re the one who’s nuts. 19 Mar	This entry was published on March 19, 2011 at 3:23 pm and is filed under Toward Nirvana, Uncategorized, Zen Sarcasm. Bookmark the permalink. Follow any comments here with the RSS feed for this post. I firmly believe that there’s always a rational explanation for what we consider irrational behavior. Rational to the person doing the action. Luckily, we have people who can think irrationally and solve crimes like that one. Maybe the irrational is really normal. Maybe the world doesn’t make sense after all. Maybe this scene represents the world perfectly. Who’s shoes are these? Hmm….This is about when I start to feel crazy and drink some tea to center.